It’s the calm after the storm as the action begins to ease into the weekend following the excitement of the Plate and the Hurdle at Ballybrit, but one man who has been on form all week is Willie Mullins – and it can pay to keep him on side. The Closutton maestro may be the man to follow again in tonight’s headline act – the Guinness Premier Handicap – as he throws four darts at the €100,000 feature in a bid for back-to-back victories. Limini ran a cracker in defeat in Monday night’s showpiece after defying nearly 18 months off and if the four-day turnaround isn’t too much of an inconvenience, the seven-year-old mare is the class horse in the race and the one to beat. Ger Lyons and Colin Keane have been in good form this week and Pepperoni Pete ticks a lot of boxes. Staying on strongly when fifth over six furlongs at Fairyhouse on his debut two weeks ago, he had Aidan O’Brien’s Coral Beach (second) and Denis Hogan’s Arabic Channel (fourth) ahead on that occasion, but shaped with promise and can turn the tables. There should be more to come, but the same may not be said for Coral Beach, which has been expensive to follow having failed as favourite on four of his six racecourse appearances. Dermot Weld has endured an abysmal week by his unparalleled standards at Ballybrit. That said, Zuenoon was far from disgraced on debut when showing greenness, but Pepperoni Pete may have the most improvement. VERDICT: Pepperoni Pete can score for the in-form duo of Lyons and Keane. Favourites have struggled in this open 18-runner handicap, with just two obliging in the past decade. Having already visited the winners’ enclosure this week and enhanced his growing reputation as a trainer, Emmet Mullins is a man to follow for the future, but Bustam struggled here on Monday and may be best watched. It’s taken Passing Trade a while to get the hang of things but after a fine effort in defeat at Ballinrobe in June, she kept on well to score at Bellewstown for Michael Mulvany and can make the frame. Andrew Slattery’s Kudbegood nearly sprang a huge 66/1 shock at Limerick in April and after being a reserve on Monday, he gets his run and shouldn’t be discounted, but preference is for Gizi Gazelle. Eamonn O’Connell’s charge left all known form behind him when comfortably scoring at Tipperary in May and hasn’t been seen since. With Dylan Hogan taking a valuable 7lb off after shooting up 13lb for that victory, he is favoured to prevail. VERDICT: Gizi Gazelle can leave his rivals trailing in his wake. There is a fair element of guesswork involved, given the lack of racecourse experience for many of the nine runners, but the market should be a good guide with no horse bigger than 4/1 prevailing in its four runnings. Weld has a 50pc record, with two wins, and the master of Rosewell House looks to have an ideal candidate in Lure Of The Sea, runner-up in a Curragh maiden last month. Joseph O’Brien’s Cascabel didn’t pull up any trees on debut at Killarney last month while his father Aidan is represented by Queen Iseult, who is six runs without a win. Michael O’Callaghan’s She Got Fast showed plenty of ability on debut at the Curragh two weeks ago but the biggest test may come from Tom Mullins’s Shes Gold, who was doing her best work at the end of a Killarney maiden and may go close. VERDICT: Weld’s fortune can turn with Lure Of The Sea. Mullins has collected this prize twice in the last three years and saddles a quartet of runners, none of whom can be discounted given his remarkably strong hand. Limini showed that she hasn’t lost any of her class when just touched off by stablemate Uradel in Monday night’s feature following nearly 18 months off the track and will take some beating. With the assistance of Kevin Manning, the bounce factor is a slight worry for the 2016 Cheltenham Festival winner, but having beaten a subsequent Group Two winner when scoring on the level in France, she is much better than her mark of 89. Gustavus Vassa seems to have found his trip over 12 furlongs and ran two crackers for Mullins in defeat to Sea The Lion in decent handicaps at Cork and the Curragh, and he looks the next best of his four contenders. Noel Meade won this race five years ago with Curley Bill, but the 10-year-old is up against it now while the fact that no three-year-old has won this contest in the last decade shows the scale of the task which is facing Gavin Cromwell’s Princess Yaiza and O’Brien’s James Cook. Tudor City kept his fine Festival record intact with a fifth-place finish in Monday night’s feature – where Limini was well ahead – and although Tony Martin’s horses seem to be struggling for form, he is also one for the shortlist. VERDICT: It’s very hard to look past Limini if she shows up in top form. 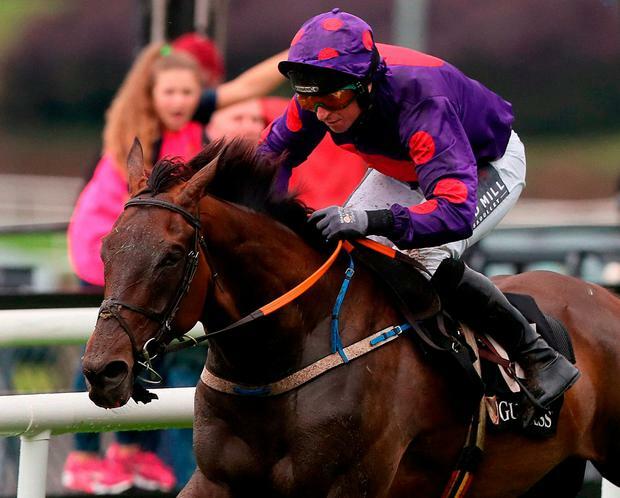 It’s no surprise that Wicklow Brave has frightened away the opposition with just four runners taking on Mullins’s nine-year-old, who has the assistance of champion jockey Keane. A winner of the 2016 Group One Irish St Leger and also victorious at the highest level over hurdles, he is definitely the most likely winner and showed his health with a decent performance at Killarney two weeks ago. 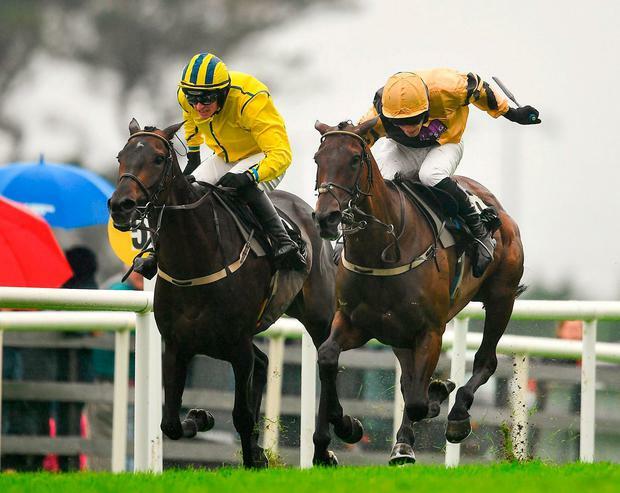 He is hardly a betting proposition at odds-on, however, and while Conor O’Dwyer’s Brontide is likely to be next in the market based on decent form on the Flat, he hasn’t been pulling up any trees over hurdles. Next best may be Morga for Dessie McDonogh. Second in a Listed event at the course and fifth in last year’s Galway Hurdle, he rarely runs a bad race in Ballybrit and may give closest chase to Wicklow Brave. VERDICT: Morga fits the bill in the without-the-favourite market. There was no shortage of debate about the ride Denis O’Regan gave Snugsborough Benny at Limerick last month when he came with a powerful late run to finish a close-up third. Liam Cusack’s charge was travelling smoothly all the way, but O’Regan may have left him a little too much to do and the eight-year-old is likely to be produced for a race-winning run a lot earlier if in contention. It is a typically competitive 20-runner handicap for a €30,000 pot where at least half a dozen make the shortlist, but Snugsborough Benny carries a handy racing weight of 10-12, whereas 2014 Galway Plate winner Road To Riches is going to find it particularly difficult off top weight in demanding conditions. VERDICT: Snugsborough Benny can make amends for Cusack and O’Regan. Tony Martin has won this race twice in the last three years and Voices Of Spring sneaks in at the bottom of the weights, but with his sole win coming more than three years ago, it would be a huge surprise to see him prevail. Cromwell’s Political Policy is a more likely candidate as he bids for a hat-trick over hurdles after landing the odds at Bellewstown and Downpatrick in recent weeks, but Top Othe Ra and On The Go Again look the classiest sorts. Both were reserves for yesterday’s Galway Hurdle and Tom Mullins’s Top Othe Ra won this race last year, but On The Go Again is a Listed winner on the Flat for Mulvany. 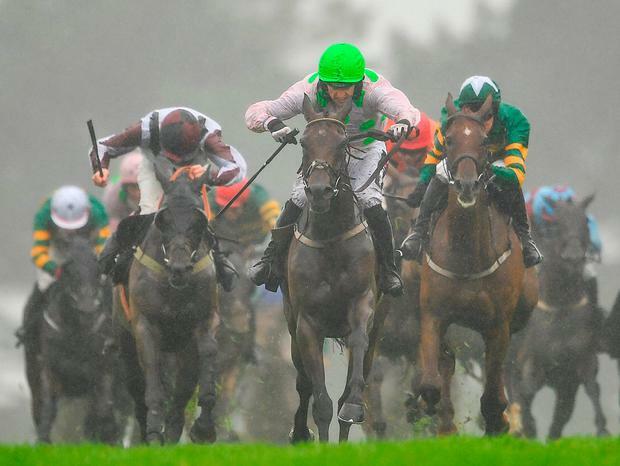 VERDICT: Davy Russell can steer On The Go Again home in front. Being a daughter of Sea The Stars, Lure Of The Sea was quite popular in the betting for her debut maiden at the Curragh, going off at 2/1 behind the favourite and eventual winner Tissiak. While she shaped reasonably well, she looks a little short around 5/4 for today’s Guinness Irish EBF Fillies’ Maiden, a race in which a number of others have realistic chances. Her trainer Dermot Weld finally got a winner at the Festival yesterday with Yulong Gold Fairy, but it’s a far cry from the old days where you could almost back his horses blindly, and make a decent profit for the week. In 2011, for example, he had an incredible 17 winners from 39 runners. Aidan O’Brien hasn’t had a huge amount of luck this year either, but Queen Iseult looks dangerous here. She’s gone close a number of times now and her experience might prove advantageous this evening. She’s Got Fast is another promising filly which can’t be ruled out. She was staying on when third to Weld’s Falcon Eight at the Curragh recently, and is expected to come on for the run. She’s Gold also ran well on her debut, and this race is more open than the market suggests.